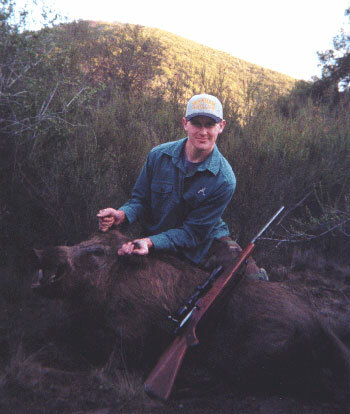 On the weekend of March 10th, my son, Kevin, and I were hunting with Marty Rovenstine Guide Service of San Miguel, California, when we shot this big boar! We had hunted hard all weekend, saw lots of fresh sign, but with the full moon the pigs were in cover early. Faced with the realization Sunday afternoon that we might get shut out, we went from shut-out to meat-in-the-freezer in about one hour's time. One shot put him down at about 5:30 p.m. The boar weighed approximently 270 pounds as its dressed weight at the butcher's shop was 123 pounds. Marty worked very hard for us, which I knew he would as I've been out with him many times over the years. This was Kevin's first pig. We're having it mounted. It was a great father/son outing!